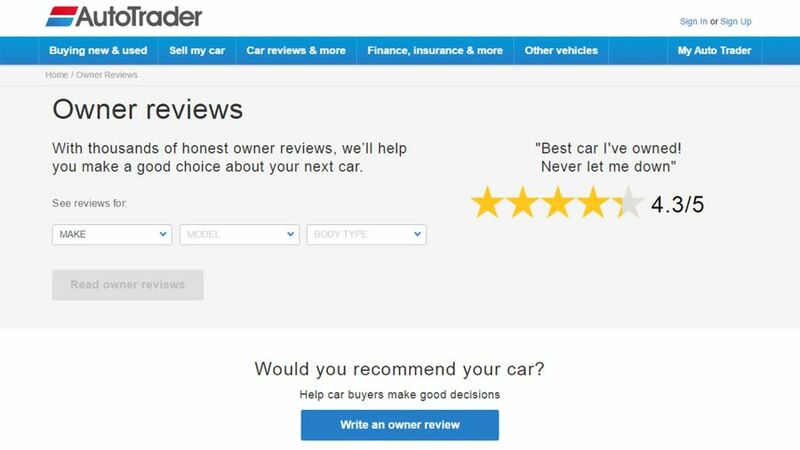 Looked at alongside Auto Trader’s Expert Reviews, our collection of thousands of Owner Reviews will give you the complete picture of what any car you might be interested in is like to live with. We have thousands of different reviews you can search through, all filed by the make and model of car. For example, if you’re looking for owner reviews of the Ford Focus, simply use the drop-down menus to find ‘Ford’, and then ‘Focus’, before choosing the body style and age, and clicking on the green ‘Read Owner Reviews’ button. That will take you to a page where you can find all the owner reviews for that particular generation of car. Each review follows the same format, and alongside the owner’s comments, you’ll find scores for four separate categories – Practicality, Reliability, Running Costs and How it Drives – underneath an overall rating, which is an average of the four scores. If you just want to know how reliable a car is, scan through the ratings for reliability. If you’re looking for a car that’s reckoned to be affordable to run, see how their owners rate it for running costs. By reading owner reviews, you can easily find out if there are any recurring problems, any particular issues to watch out for, or any particularly costly repairs. Equally, if people just lavish praise on their cars – and many do, we’re pleased to say – that’s just as important, as it can give you much-needed peace of mind ahead of a possibly expensive purchase. We’ll be the first to admit we don’t have reviews for every single model, and it’s only natural there may not be many reviews for the newest or the rarest cars. But, don’t despair, as you can still make use of Owner Reviews. If there aren’t many reviews for the particular age of car you’re interested in, look at the verdicts on previous generations of the car. And if you’re looking at a brand new car, look at reviews for similar cars from the same manufacturer to see if they have weaknesses in any area. Start looking through our Owner Reviews.